Note: There are some minor spoilers in this review. Most people seem to have read the book or know about them already, but read at your own caution. Marley & Me isn't a movie. It's more like a sounding board, a friendly but unimposing template upon which the viewer grafts their own feelings. The film is about the life of a dog -- from beginning to end -- and pet owners are likely to shed a few tears. But is that manipulative? Is the emotion someone feels during the movie genuine, generated by the film, or predetermined, coming from the subject matter? Well, it's a bit of both. There's ample charm provided by Owen Wilson and Jennifer Aniston, who are both more appealing than they've been in many of their recent efforts, but midway through the movie switches gears, and what follows is more mechanically sentimental. Based on the book by John Grogan, the film doesn't follow much of a plot. We just follow the lives of John (Wilson) and Jenny (Aniston), who get a dog as a trial run for having children. At the South Florida Sun-Sentinel where he works, John finds himself assigned to a column by his boss, Arnie Klein (Alan Arkin), despite his desire to be a reporter, but he soon begins writing about Marley. The majority of the movie's cute-factor comes into play early, with the puppy version of Marley wreaking havoc on the Grogan's household, but the movie thankfully avoids outright pandering, achieving its means through spotlighting the dog's antics instead of giving it contrived mishaps to get into. This is also the part where Aniston and Wilson shine. Their portrayal of a happily married couple is low-key and romantic, and they seem unburdened, knowing that the audience has probably come to see the dog more than their performances. The highlight is a montage with Wilson's voice-over, which hits all sorts of beats in charming and funny ways. Jenny and John try for kids, but the result is tired turmoil. 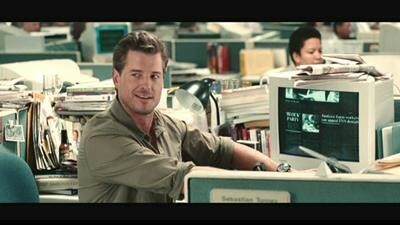 Plotlines about the stress of raising two kids, John's unhappiness with his work, and the continuing appearances of a successful co-worker (Eric Dane, looking like no reporter who has ever existed) aren't very interesting. Mostly, it's lacking in insight: couples certainly fight, but it feels like a screenplay speed bump rather than emotionally honest, and I got a little antsy waiting for it to pass. Also, Marley disappears almost completely in the background during this section, and though you could reasonably counter that the movie's as much about the people as it is the dog, I'd then wonder why the film isn't structured around the column, because aside from the montage I liked so much, there's not much sense of what Marley's companionship means to John. There's a nice scene where Jenny tells John that she can have him around for five minutes even when he isn't there by rereading his old columns, and though it's a nice sentiment, the movie doesn't show you any of John's work, so the audience can't relate. My guess is screenwriters Scott Frank and Don Roos didn't want to spell things out (as the Adaptation line goes, "any idiot can write a voice-over narration to describe the thoughts of a character"), but I think a better sense of John the writer would have been appreciated. In the third act, after John and Jenny have begun to settle down and the family is running smoothly, Marley begins to get old. I'm sure a lot of people felt that this was the strongest part of the movie, but I sort of felt the opposite. I can't deny that it got to me, because I lost a pet recently myself, but that's the problem: all the movie brings to the table are sure-fire tear-jerkers like crying kids and dying animals, and I filled in the rest. At least Wilson and Aniston's reaction to Marley's aging feels accurate and honest, although the child acting is pretty poor and director David Frankel milks it just a tad. All in all, I don't feel like the film cheated, or that it was overwhelmingly manipulative, but I wouldn't say it does anything to earn its emotional ending either. In regards to the content, the movie is a surprisingly savvy PG; there's some light sexual content as John and Jenny try to have children and a scene where John and Marley rush to help a woman who has been stabbed, but the tone of the movie is consistently family friendly, and it might even inspire some all-important conversations about life and death with the younger set. I'm glad the MPAA didn't feel the need to clamp down on the more adult but realistic little touches that fill in the lifelike familiarity of the movie. 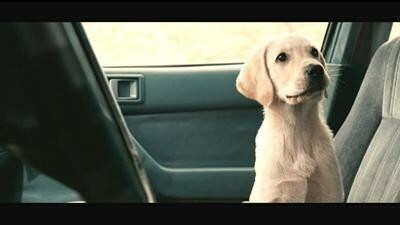 When it was all said and done, I felt pretty vague about Marley & Me. I was engaged by the movie while it was going, but I felt like I'd done more of the emotional lifting than the film itself, which is fairly lightweight. I imagine the book, a firsthand experience of what actually happened, provided a more personal connection between the author's love for his dog and his readers, and sadly no such connection translates to the screen. Still, the film is proficient at a certain level, crafting an accessible story of man's best friend that anyone who's owned a dog will know by heart. Anyone in the mood to take the journey, warts and all, will probably be satisfied, but Marley & Me won't hold a candle to some real-life companionship. Fox didn't send me the packaging, but a red front cover with a simple (read: boring) image of young Marley should be expected, and the video menu is easy to navigate. Since this isn't final product, I can't comment on the video quality of what will be a 1.85:1 anamorphic widescreen presentation, or the eventual English Dolby Digital 5.1 soundtrack. I can say that French and Spanish 2.0 will also be included, as well as English captions for the hearing impaired and French and Spanish subtitles. The 2-disc "Bad Boy" edition has all the features crammed onto Disc 1, with Disc 2 holding only the digital copy, for which there is a pre-menu ad on the first disc. Fox's Live Free or Die Hard was one of the first DVDs with Digital Copy, and it had both a slew of bonus features and the digital copy on the second disc, but someone apparently realized they could make more money by jacking up the price tag on essentially one-disc special editions by tossing on an otherwise-empty second disc. It's annoying, and Disney's method of releasing separate packages with and without the Digital Copy is my preference. Deleted scenes (26:17) is a collection of genial but non-essential clips and trims. A couple of them are extensions of what's in the movie, which were probably trimmed down to get the movie a PG rating. Optional commentary by director David Frankel is included, although the reasoning behind the trims is pretty much the same (time), and some of the scenes are so short he doesn't really have much to say. A series of dog-centric, TV-special-level featurettes are included. "Finding Marley" (7:49) introduces us to Clyde, Jonah, and Rudy, the three lead dogs on the movie and covers their individual training. "Breaking the Golden Rule" (8:03) is a basic EPK-style piece with interviews from Owen Wilson, Jennifer Aniston, Eric Dane, Kathleen Turner, David Frankel and John and Jenny Grogan and film clips ad nauseum. "On Set With Marley: Dog of All Trades" (2:37) is the always-expected. always terrible tongue-in-cheek featurette where the dog is "interviewed". Yuck. "Animal Adoption" (5:19) is a reminder that there are lots of dogs at shelters and pounds looking for homes, and that anyone who feels the burning urge to adopt a pet after watching Marley & Me should check there before hitting the pet store. Anyone who scours the internet looking for cute pet videos should enjoy the seventeen home video spots comprising "Purina Dog Chow's Video Contest Finalists" (6:05) and "Purina Dog Chow Hall of Fame" (2:07). Lastly, we have a weak gag reel (5:41) and an equally lame additional outtake called "When Not to Pee" (2:18) in which David Frankel slowly overexplains a close call. The major disappointment is a lack of commentary; a track with insight from the real John Grogan could have been great. The film is a lightly enjoyable experience that will hinge on your own pet experiences, but this DVD is mostly filler, with a slew of uninteresting featurettes and a wasteful second disc with only a digital copy. A rental should do just fine.